The scanner is extremely quick, it scans all sorts of paper without any problem and the quality of the scanning is superb. It has been a major contributor to us gaining greater efficiency in our business. This tiny device is so fast we had to buy a new PC just to keep up with it (entry level PC's are woefully underpowered). I particularly like the space saving tilt mechanism. The Kodak Smart touch software works well, giving you 9 configurable one touch scanning modes. To get the most out of it other scanning software is required. Bundled with the scanner is OmniPage Pro 14 and Paperport 10 from Nuance. Paperport was not appropriate for us, we needed a folder/file based archiving solution. OmniPage has high quality OCR and can produce full colour, multi page, text searchable PDFs, as well as convert to standard document and spreadsheet types, retaining graphics and tables. However, the level of automation of document processing, is not acceptable for our main use. OmniPage does work well for our lesser secondary filing. For our main processing we use DocScanPro from Solarsys. This allows automatic document separation, removal of blank pages (i.e. reverse side of single sided documents, interspersed with double sided documents), file and folder naming based on content of document, and conversion to searchable PDF (currently only black and white). Unfortunately for us, we need to scan a lot of carbonless multipart documents, which the feed rollers struggle with. But with regular cleaning, the problem can be avoided. I would prefer a larger capacity input tray, it is specified as 50 sheets, however to get optimal feeding, we have experienced a maximum limit of 40 thin sheets to be practical. Also to ensure good feeding I recommend putting in the first few sheets to the 'stop' and adding the remainder afterwards, which then sit approx 20mm further out. Overall the Kodak i1320 is small, fast, high quality, simple to use, and comes with a three year warranty. Highly recommended. Thank you for recommending this product. Once we have reached full production volume, I will let you know what my users think and hopefully should get some positive feedback from our managing director too. 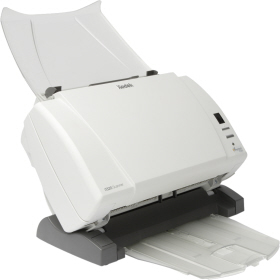 The Kodak i1320 document management scanner delivers the highest level of capability and affordability of any product in their category. This is true breakout performance, with ease of use, versatility and image quality that sets a new benchmark.